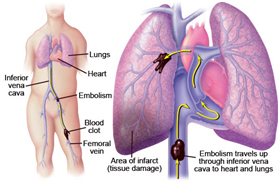 Chronic pulmonary thromboembolic disease : -Some emboli do not dissolve but become 'organized' with fibrous scar tissue, blocking the vessels in the lungs. Prophylactic : - to prevent progressive right ventricular dysfunction or retrograde extension of the obstruction, which might result in further cardiorespiratory deterioration or death, and to prevent secondary arteriopathic changes in the remaining patent vessels. 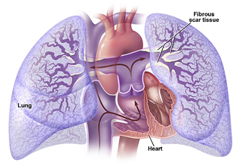 The prevention of secondary arteriopathic changes is an important indication for surgery. 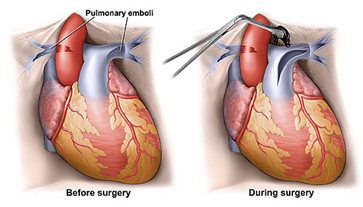 Pulmonary Thromboendarterectomy : - Blood clots can be removed directly from the pulmonary arteries by open-heart surgery.